The Third Carriage Age: 1906: SPEED MADNESS on the Corbett Road! 1906: SPEED MADNESS on the Corbett Road! Upper Market and Corbett, 15 years after the events in this story. Courtesy of San Francisco History Center, San Francisco Public Library. ...only to succumb to the temptations of... SPEED MADNESS!!! For added ambience, click on the song lyrics (below) to hear the soundtrack. Who lost? Why lies he in this silent bed? He lost, of course; death won. 'Nuf ced!" But, even as it is, it was with difficulty that the gaunt king of the valley of the shadow was driven from the bedside of Emerick. With a crown that is cracked and a body racked he tosses, sometimes in pain, sometimes in delirium, as a phantom car hurls him into imagination's eternity, at his home, 1245 O'Farrell street. Guarding his life Is Dr T. C. Macdonald. "He is improving," said the physician yesterday. "Consciousness returns at intervals. He will get well." And this is how it happened. Thursday evening, dinner through and the cigars passed round, Emerick's mind swept back to the joys of anteconflagration days. "Let's get back to normal conditions,” he said to the merry party around him, "and take a whirl through the park in automobiles." Agreed. Two big touring cars soon wheezed up to the door. In one Mr. and Mrs. David Fox, W. W. Collins and Mrs. Mallory, who conducts the O'Farrell street home, were seated. In the other. Emerick and Miss Mallory were comfortably installed. 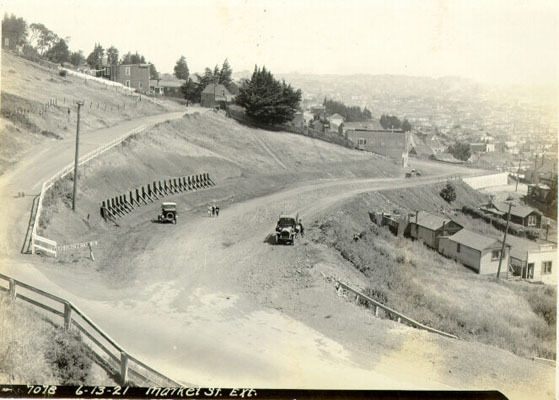 "To the Cliff House" was the order to the chauffeurs, and off rolled the "devil cars." Down the road of life we'll fly — "
"Let's fly, too," said Emerick. “Let's race. Smoke up, boys; let'r out." Caps were pulled down; goggles adjusted. The two chauffeurs leaned forward, touched a lever here, a lever there and off they rushed through the night. Speed madness, they say, has been Emerick's failing, the terror of his friends and the joy of life to him. As though it caught his thrill his auto plowed forward and soon was victor in the spurt. "Good-night, we're going home." shouted Fox from the vanquished car, and turning around, headed back for the South Drive. "We'll come home along the Corbett road and see if we can't beat them out." said Emerick. "Advance your spark to the limit and give 'er all the benzine she'll eat." The chauffeur obeyed and the car sped through the dark like a comet astray until just at the spot where, not long ago, dare-devil Jack Baird was killed for his folly. Perhaps it was the same rut that turned Jack Baird's machine a somersault and crushed out his life that ripped the wheel from the hands of Emerick's chauffeur. Like a giant acrobat the car leaped into the air, turned clear over, righted and stood still. In the road lay Emerick, bleeding, covered with dust and gasping. Hanging by her gown from a barbed wire fence at the roadside but little injured was Miss Mallory. Still gripping his seat was the chauffeur, who affirms with wide eyes and raised hand that there's where he sat through all the tumble. Hurrying to Miss Mallory's side the chauffeur tore her gown from the barbs and assisted her into the automobile. Then he dragged Emerick to the car and lifted him in. A tire was flat and two of the four cylinders of the engine were out of commission, but the car responded to his skill and moved off for home. Their arrival at the O'Farrell-street dwelling threw the Mallory household into wild excitement. Dr. Macdonald was hurriedly summoned and for a time his prognosis was unfavorable. But yesterday Emerick brightened. Now the physician says he will recover. Many weeks will pass before Miss Mallory's nerves are quiet again and like the beaten pugilist, the chauffer's courage has suffered a permanent scar. Emerick is senior member of the firm of Emerick & Duncan, brushes and cordage, 1245 O'Farrell street; David Fox was chief clerk at the destroyed Russ House; Collins resides in Alameda. He is a member of a wealthy Eastern family and came to the city to view the ruins. For all of them automobiling has lost its charm. 1. Yes, it is necessary that SPEED MADNESS appear in all caps. 2. No, you can not get that song out of your head now. 3. Emerick recovered, and went on to a successful if not particularly exciting career in cordage, brushes, and paints.